You didn’t have to be a kid in the Nineties to know about Sabrina the Teenage Witch, you just had to have a few of your own. The sitcom, based on the lighthearted American comic books and starring Melissa Joan Hart as perky Sabrina Spellman, who discovers on her 16th birthday that she’s a witch descended from a long line of witches, was an inescapable after-school presence on Nickelodeon and RTE2. The cheesy adventures of the well-meaning but bungling half-mortal Sabrina, who lived in the suburbs with her aunts (also witches) and their talking cat Salem — really a 500-year-old warlock condemned to a lifetime of eating Whiskas and coughing up hairballs for trying to take over the world — were enormously popular. Well, that Sabrina is dead and buried and she’s not coming back — unlike one of the characters in Netflix’s upcoming Chilling Adventures of Sabrina, who’s decapitated with a shovel and buried in the backyard, but up and walking around again, head reattached, in the time it takes to say “Boo!”. Arriving on Netflix on Friday, October 28, just in time for Halloween, Chilling Adventures of Sabrina is not, as you’ve probably guessed already, a comedy and very definitely not suitable for the age group that enjoyed the old one. Based on a critically lauded comic book series of the same name, aimed at an older readership, it’s pure horror played straight and serious, although there are splodges of macabre humour here and there. 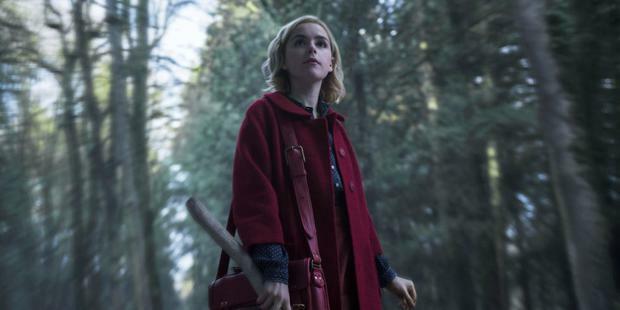 The new Sabrina, wonderfully played by Kiernan Shipka (Sally Draper in Mad Men), keeps the bare skeleton of the old one. She’s still in high school and lives with her aunts Zelda (a terrifically bitchy as well as witchy Miranda Otto) and Hilda (The Office’s Lucy Davis, providing a little comic relief). This time, though, they’re joined by her English cousin Ambrose (Chance Perdomo), who’s been placed under house arrest for illegal witch activities. She still has a boyfriend called Harvey (Ross Lynch) and the bad news is he’s still as sappy as ever (the teen romance between the two is the only weak element here). Salem is still there too, but this time he’s a hideous, Gollum-like creature who Sabrina chooses as her loyal “familiar” in feline form. The series is probably closer in tone to Rosemary’s Baby than Buffy the Vampire Slayer, with similarly high stakes. Sabrina is about to turn 16, which means it’s time for her “dark baptism”, a ritual in which she signs (in blood, naturally), the Book of Night, granting her vast powers, but also effectively making her a bride of Satan. Once she’s signed, she must leave her current life, turning her back on her mortal friends forever. She’s not about to do that and rebels at the last moment, incurring the wrath, not just of the powerful and sinister Father Blackwood (Richard Coyle), who’s the head of the Church of Night, but his immediate boss, Satan himself. Lurking in the wings is another enemy, a cunning demon, played by the glorious Michelle Gomez, who’s possessed the body of Sabrina’s favourite teacher. Chilling Adventures of Sabrina is beautifully (witch)crafted, from the gorgeous, comic book-style opening titles to the dazzling set design, and doesn’t stint on the scares. Stand-out scenes from the first two episodes (which is all I’ve managed to watch so far) include Sabrina being chased through a maze by a living scarecrow, and Satan, complete with horns and cloven hooves, bursting forth from a tree trunk. This is very much a Sabrina for the #MeToo era. She flies in the face of the nasty, sexist high-school principal (Bronson Pinchot) by setting up a women’s group and uses her supernatural powers to exact a humiliating revenge on the obnoxious jocks who assault her genderqueer friend Susie (played by non-binary actor Lachlan Watson). Above all else, though, it’s a marvellous, creepy Halloween treat.